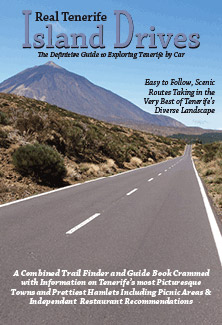 A question we are asked more and more is about family friendly walking routes on Tenerife. 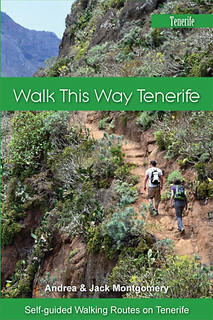 One of the appendices in our Walk this Way Tenerife guidebook lists fourteen routes which we consider family friendly due to length, difficulty levels, and points of interest along the way which should appeal to children as well as adults. But what is and isn’t considered family friendly can be quite subjective. It can vary, depending on what ages children are or whether people are walking with a baby carrier or a buggy. It can even depend on something like personal background/attitude or even nationalities where there’s a difference between those where walking is more part of the culture and those where it isn’t. For example, ask me this question a decade ago and I’d have said the western Canary Islands weren’t really suitable for walking with young children. The landscape is often very steep; paths can range from narrow goat trails and lava fields, which are tiring on the soles of the feet, to uneven rocky merchants’ trails. Long, flat paths aren’t exactly common. Seeing young children cross steep slippery slopes in Dachstein Austria, negotiate almost non-exist paths in Berchtesgaden or skip up slippery stream beds on La Gomera and La Palma reminded me of something I already knew from my days growing up on a Scottish island where the countryside was one big adventure playground. Children are fearless. In February on Tenerife we made the mistake of walking the almond blossom route in Santiago del Teide on a public holiday. 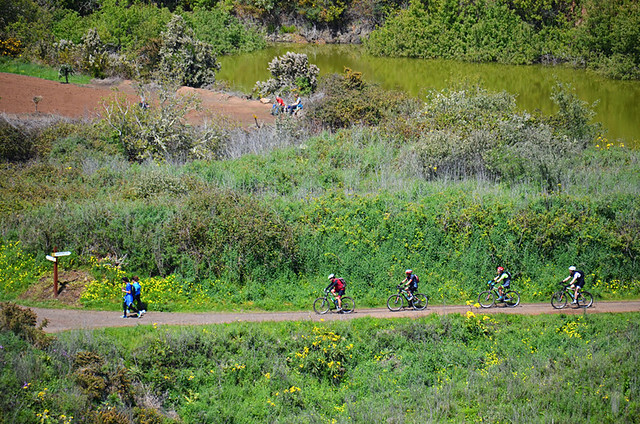 The route was packed with tribe-sized local families; family members ranging from the oldest member to the youngest. It’s not the most difficult of routes, but it’s a decent length and a significant part of it crosses rough lava. However, I mentioned it can depend on personal attitudes and nationalities. When we completed the walk we passed a visiting American family. They hadn’t managed to get very far as the children, probably around the 10-12 age group, had become bored. When the walking involves even younger children, then what is suitable can be even more subjective. Walking with a baby carrier opens up more possibilities than walking with a buggy and who’s to say what routes any individual walking with a baby carrier considers as being suitable. We’ve passed walkers with baby carriers on some of the most challenging routes. 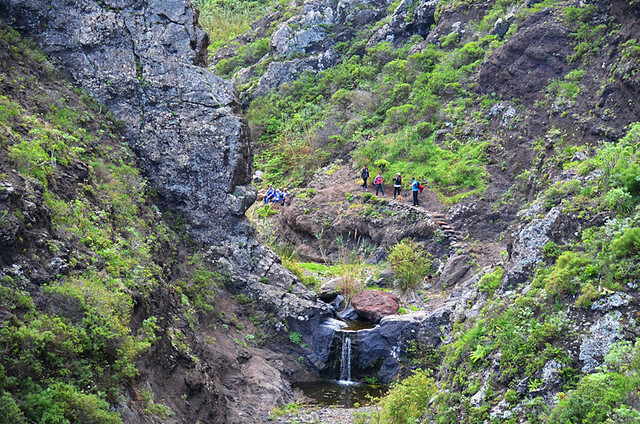 Worryingly, in the Masca Barranco recently we passed one walker with an empty baby carrier. We weren’t sure whether to point that out to him in case baby had slipped out at some point whilst he was negotiating the path. In Anaga we met a young German couple with a baby carrier as we were finishing a relatively demanding route at the end of a long day, and they still had kilometres to go before their route was over. This is partly why it’s impossible to say definitively what are suitable routes for children. Walking with a buggy is different. I’d say most walking routes across the island weren’t suitable for walking with a buggy. However, that makes it easier to identify the handful of ones which are. Promenades are obviously ideal. The one linking Los Cristianos with La Caleta in Costa Adeje can involve 11km of walking just one way, so a decent leg stretch. 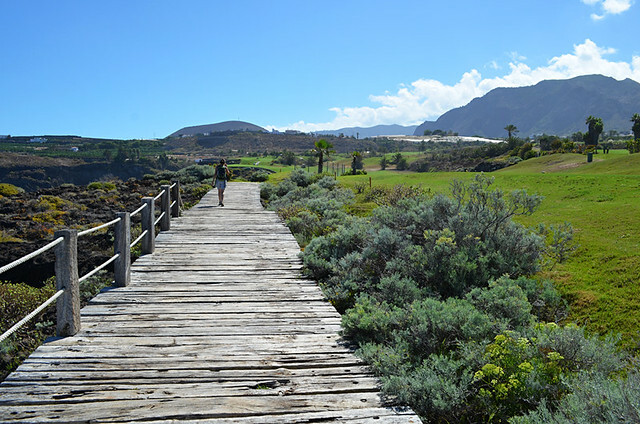 Most of Tenerife’s resorts have promenades of varying lengths, but promenade walking isn’t quite the same as rural walking. There are other charming coastal paths in traditional areas which, whilst not so manicured as modern resort proms, would be okay for buggies. These are mostly found along the north coast where sections of former merchants’ trails linking coastal settlements still exist. Inland, some wide forest pistas are also good surfaces for buggies. 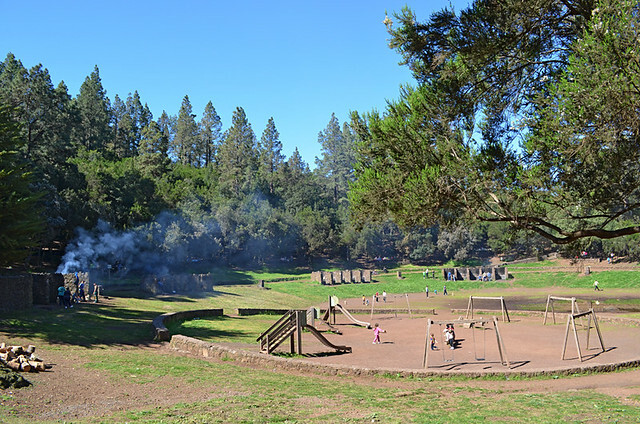 Wide paths leading from La Caldera in La Orotava allow at least a taster of walking in the pine forest and there’s a great zona recreativa to enjoy a picnic at the end of the route. Then there are routes which have been specially created so people in wheelchairs can enjoy parts of the island they couldn’t otherwise reach. 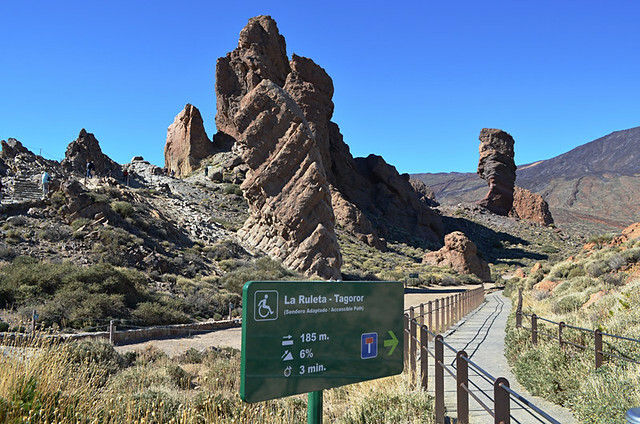 These paths include the route of the senses, accessed from Cruz del Carmen in Anaga; a circular forest trail from Agua Garcia above Tacoronte (not an easy place to find) and a section of the Roques de Garcia in Teide National Park. 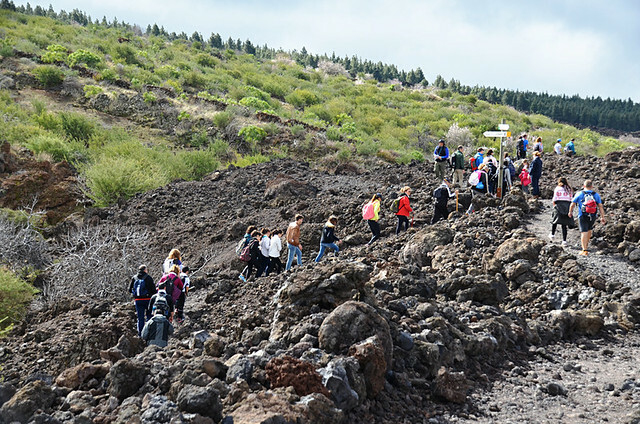 In fact some other paths through the crater, such as Siete Cañadas, should be manageable with a buggy. 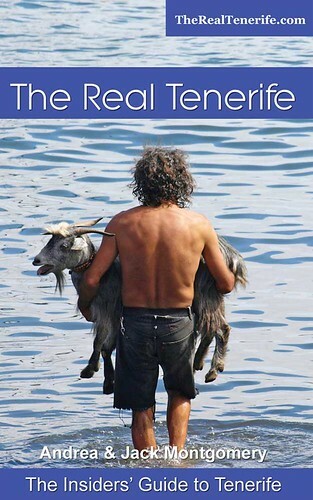 Ultimately, there is actually a decent selection of family friendly walks on Tenerife, especially for the more adventurous families. Finding them and getting to them is another matter.